I appreciate all the pollinators at Clay and Limestone, but, my favorite has always been the Bumble. I learned that they are social bees that build nests in the soft earth or leaf litter. I learned that they are generalist and will visit almost any nectar and pollen producing plant, but, like all creatures, they do seem to appreciate a varied diet, so I have planted dozens of plants, native and specially chosen exotics, for them to choose among! I always knew they were gentle, but, I learned they did not swarm and rarely stung. 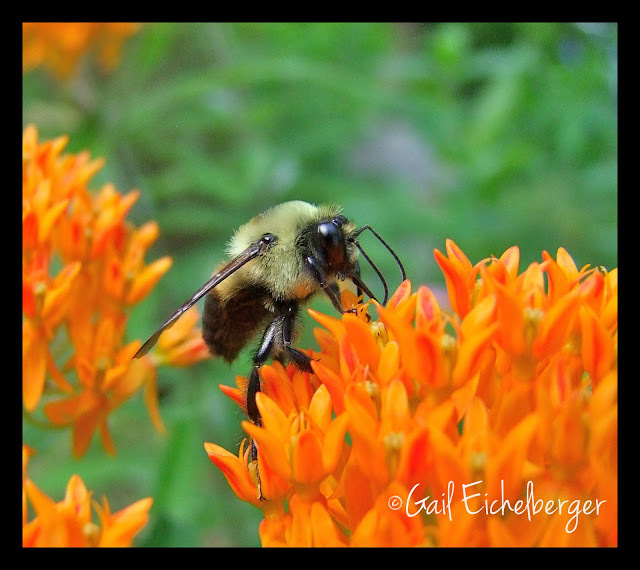 I discovered that they are major pollinators in vegetable gardens and orchards~If you want tomatoes, you need bumbles and if you love orchard crops, berries, watermelon, sunflowers and other fruits you also need bumbles. They pollinate 1/3 of what we eat and that 80% of the world's crops are dependent upon them for pollination. I read that Bumbles and other native bees prefer yellow, purple, blue, violet and white flowers~But, I've seen them on almost every colored flower in my garden. I also learned that their numbers are decreasing and that gardeners are important partners in helping them make a comeback. provide nesting sites for a variety of visitors: Build a pollinator condo, leave some bare ground for earth nesting bees and pile decaying logs for beetles who like to tunnel. Of course you all know the one of the very best things you can do for pollinators is to never, ever, ever, ever use pesticides! Beautiful captures of your bees! I have lots of bumble bees and now that you mention it they are the first and last to leave! I love seeing them resting in the early morning on blooms. They work so hard! Here's to the hardworking bumbles ... and to you, their tireless champion! Hi Gail....boy, some of those bees have collected a lot of pollen! I have lots of Bumbles in my garden and even though I get so close to them they've never tried to sting me...they just go about their business. I have quite a few clumps of Butterfly Weed in my garden but this year two odd stems came up out front in different places. I had no idea what they were so I waited. Come to find out they are pink Milkweed. I was so excited to have them. Thanks for all the great info on the bumbles...I really enjoyed this post! Beautiful pictures, especially the first one. Makes me want to get out my paints and paper. I think that last bumble just had his hair done. Soft enough to pet. I'd say those are all good reasons! I love bumbles, too. My A. tuberosa isn't doing very well, but hopefully and blast of warm air will help it perk up. Plenty of rain, this year, thankfully! Such vibrant colors in your garden, Gail! I adore bumbles as well for all the reasons you stated...hard working friendly bees that help me grow food....wow! And they're pretty cute, as far as bugs go! I always feel like their presence in the garden means that my garden is healthy. It's always nice to garden surrounded by (friendly) bees and other pollinators. That's the way it should be! Bumbles are my favorite as well. They are very common in my garden and are fun and fasciniating to watch. I didn't know about the list of favorite colors. I have many of the same flowers you show in your lovely photos - butterflyweed, penstemon, aronia, etc. Does it seem to you that there are fewer bees around this year? Beautifull photos and your point about the importance about pollinators is well taken. Thank you for taking time to share. The bumbles have been very busy in my rhododendrons for the past two weeks--we counted over 25 on one bush alone the other day! There's a constant buzzing drone around our house this time of year! I can also always seem to find a few on the May Night Salvia. You got some great shots of them on your flowers!